I cleaning up the piano room, I got back into some saws I've had around for a while and was wondering their ID. 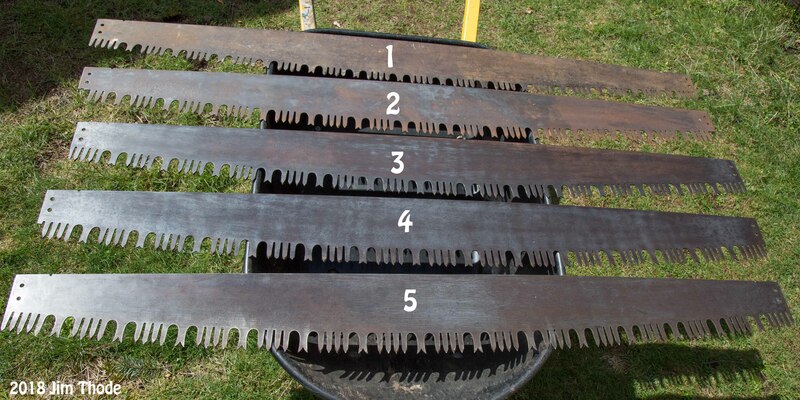 On two saws I noticed that the lengths are not even and that one end had an extra cutter. For example on a possible Simonds 520, the length is 60 3/16" instead of 60", and one end has 5 cutters, 4 on the other. Two ideas come to mind. The slight asymmetry is designed to keep vibrations damped. But that doesn't seem too likely. Or, the length is an artifact of working a, say, raw blank into one ready to have teeth cut/stamped. Maybe whatever processes were used (tensioning?) caused a slight lengthening of the blank. In the above case, the saw is 0.3% longer than 60". But then why not just trim the blank to an even length? I have seen that the length of saws and the number of starter teeth vary a little with the same nominal length and brand/model. Also the number of starter will vary even more with different lengths of saw (like 5', 6' and 7') of the same brand and model. The spacing of the teeth in the body of the same is nearly the same on each brand/model and they just filled in the ends as needed to made them close to the nominal length. Look at this photo and you can see different 5' Simonds #520 saws. Some have five teeth on both ends and some have 5 and 6 teeth on opposite ends. There is no real reason to make them all exactly same and they did not. A 5 1/2' #520 may have 7 starter teeth.